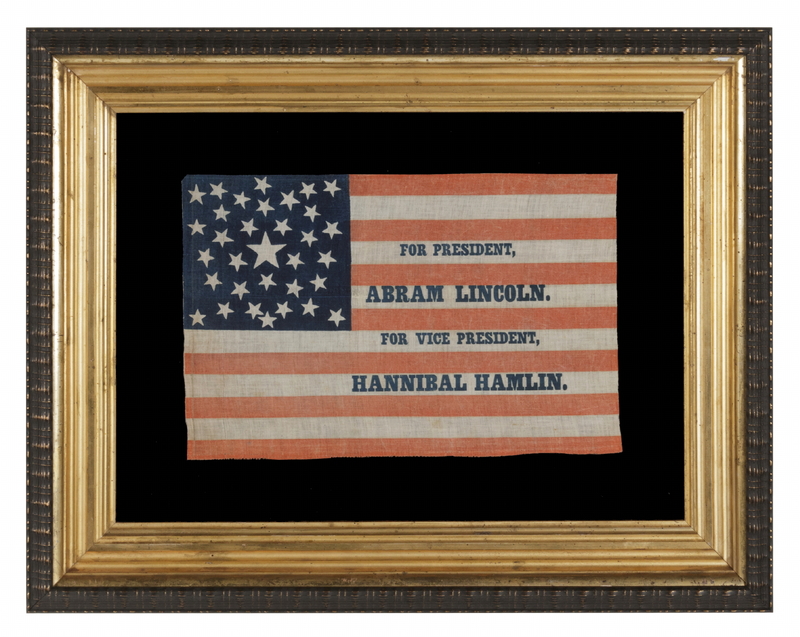 Frame Size (H x L): 23" x 29"
Flag Size (H x L): 11.5" x 17"
There has been much speculation on the variation of Lincoln’s first name on campaign objects. 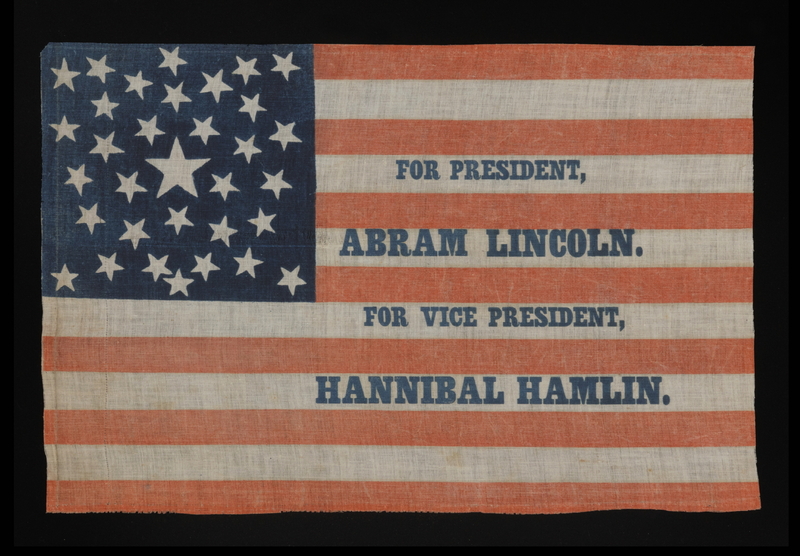 Roger Fischer, scholar of campaign material culture, suggests that objects made for “Abram” Lincoln were manufactured early in 1860, before many easterners discovered the relatively-unknown Republican candidate’s true name. 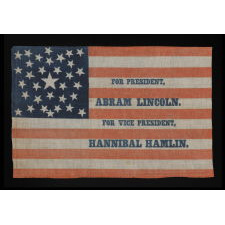 It has also been suggested that Abram was a nickname, given to him by close friends, but Daniel Weinberg, longtime Lincoln scholar and owner of the Abraham Lincoln Bookstore, relates that this isn't true, and friends simply called him "Lincoln". Perhaps the makers simply shortened the name to save space. In any event, the use of "Abram" is an interesting peculiarity. The stars of the flag are arranged in a very interesting medallion pattern that is loosely based on a pentagon with various stars outside it. The design is related to a handful of others that I have termed "pentagon" or "heart" medallions. The basic profile of these star patterns consists of a pentagon-shaped outline. In some cases the pentagon is more distinct than in others. In this flag it is a bit less obvious. Some of the variants contain a "Great Star" pattern, a large star made out of smaller stars, hidden in the middle, like this example, where it can be seen in the 10 stars that surround the large center star. In some cases the pentagon begins at the top but the overall pattern morphs into a shield. 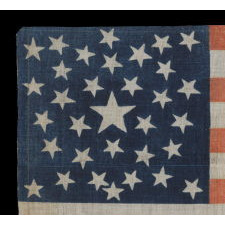 One might suggest that the stars of this flag form a shield, though the shape isn't as distinct as it is on other flags. Whatever the case may be regarding the symbolism in the canton, the star design is both beautiful and intriguing. 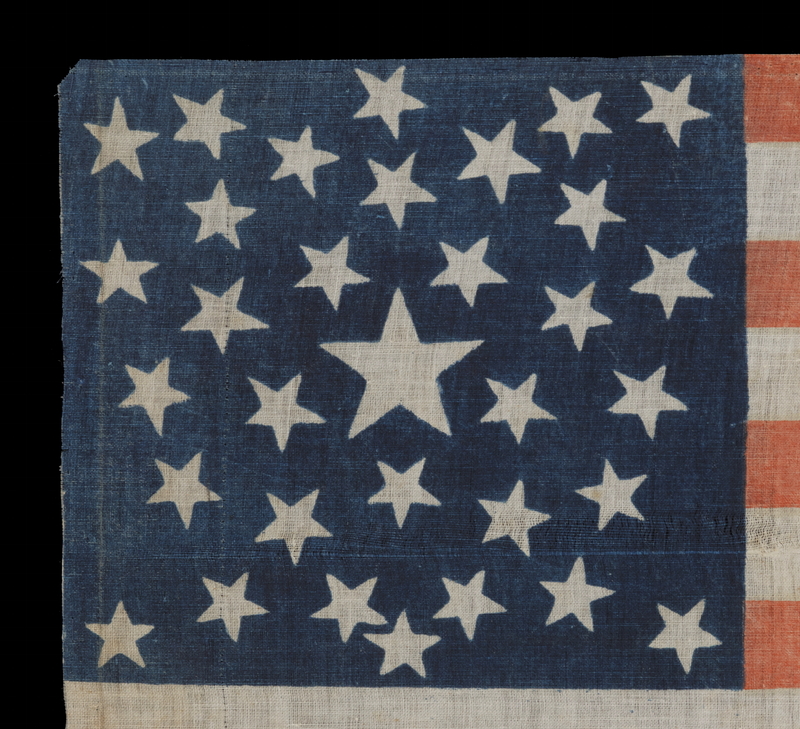 Prolific flag-maker H.C. Howard of Philadelphia is known to have produced designs that used both the shortened version of Lincoln's name and unusual star patterns with pentagon arrangements. 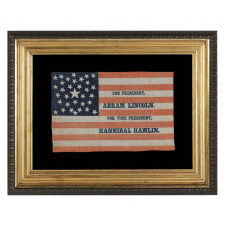 This particular parade flag was at one time sewn into a quilt that consisted of many rare political flags. Many years ago these were deconstructed and the flags were individually sold because of their significant value. Evidence of the original stitching that joined the flag within the quilt is present along the top and bottom edges. 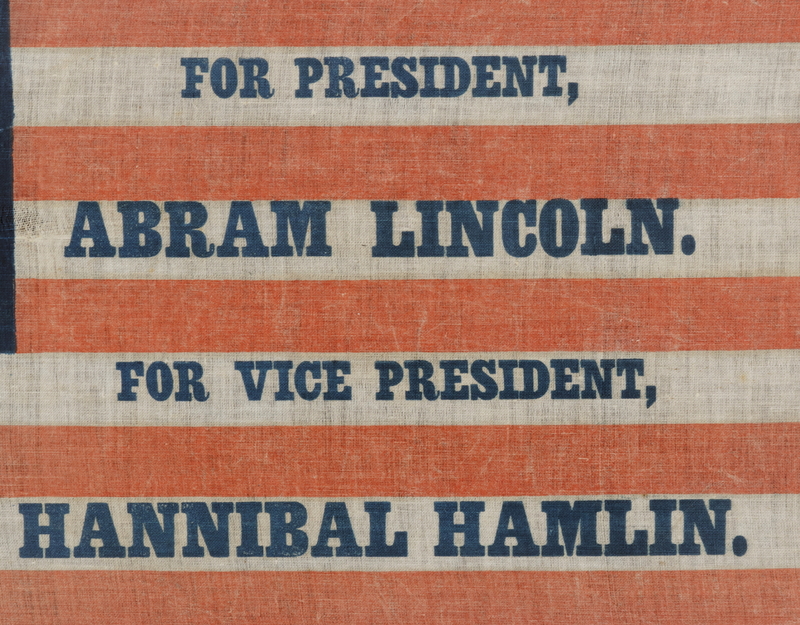 It is interesting to note that Lincoln was hardly the favorite at the beginning of the campaign, winning the Republican nomination from the 3rd ticket. He then defeated John Bell (Constitution Party), John Breckinridge (Southern Democrat), and Stephen Douglas (Northern Democrat), to become the Republican party’s first president. Lincoln was elected with a mere thirty-nine percent of the vote and carried no state south of the Mason-Dixon line. 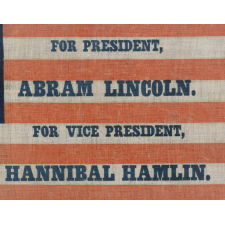 Hannibal Hamlin, our nation’s first Republican vice president, was born in Maine in 1809. He was an attorney who, in his political career prior to the White House, served as Chairman of the Maine State House of Representatives, as a U.S. Congressman and Senator, and as Governor of the State of Maine. He was a Democrat until 1856, but was an opponent to slavery. He did not run with Lincoln in the second campaign in 1864, but did return to the U.S. Senate from 1869-1881 and served as Minister to Spain from 1881-82. 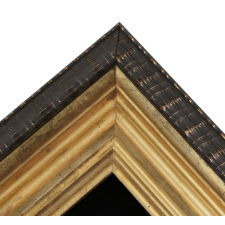 Mounting: The exceptional, gilded American molding dates to the period between 1820 and 1850. 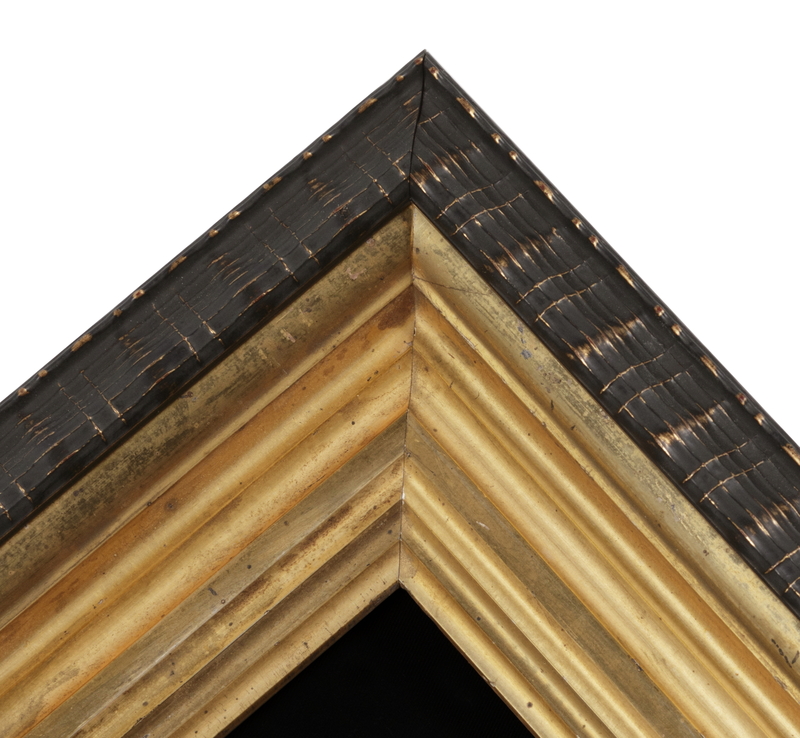 To this a modern molding was added as a cap, with a rippled profile and a black surface with gold highlights. The flag has been hand-stitched to 100% cotton twill, black in color. The black fabric was washed to reduce excess dye. An acid-free agent was added to the wash to further set the dye and the fabric was heat-treated for the same purpose. Spacers keep the glazing away from the textile, which is U.V. protective glass. Condition: There is minor fading of the red-orange stripes, but the overall condition is excellent.